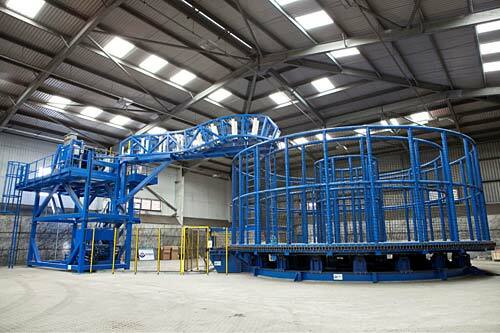 A North East global supplier of fabrication and engineering services has successfully fabricated and installed – in only 11 weeks – a 700-tonne carousel which will be used for the storage of spare cables for UK offshore windfarm projects. Stockton-based Francis Brown was commissioned to fabricate and site install the 700-te carousel to the project base in Sunderland, by Ecosse Subsea Systems on behalf of an international infrastructure group. With the ability to upgrade from a 700-te to 1,700-te capacity, the carousel comprises a number of key items and sub-assemblies including; basket and core, grillage, rollers and tracks, floor, drive system and central bush. “These key values are underpinned by our ability to constantly deliver on time and on specification. And, with a growing demand for storage carousels across the renewable sector, we firmly believe delivery of this project can only lead to further opportunities for us in this growing market,” adds Roddy.